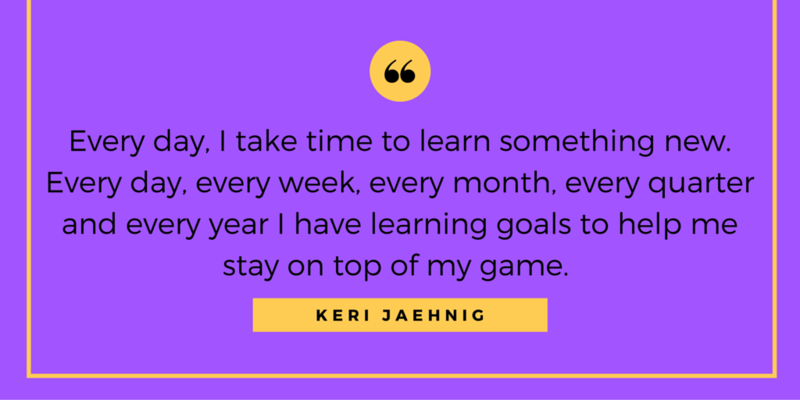 After more than 14 years in international education, Keri Jaehnig took her passions for communication and relationship building to the digital sphere. The CMO and founder of Idea Girl Media in Ohio, she’s launched social media campaigns ranging from local to international levels. While Business Insider has quoted her, Forbes and Search Engine People feature her work. 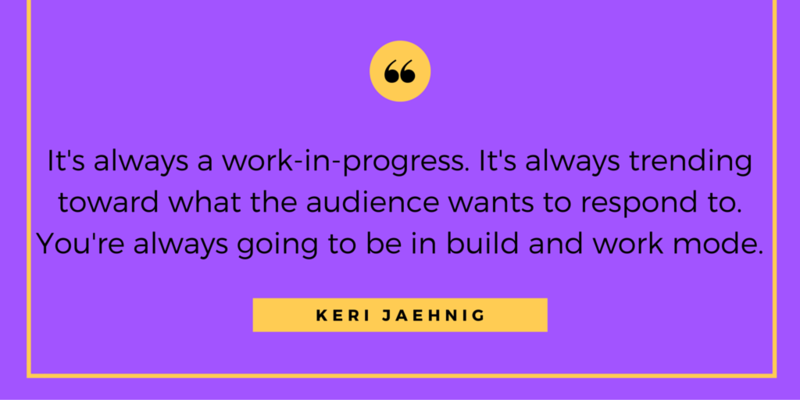 Discussing how to take a hands-on approach to social media, Keri Jaehnig is the fifth entry in Keyhole’s marketing influencer interview series. Keyhole: How do you use analytics and analytics tools in your social media strategies? Keri Jaehnig: I’ll fess up here. I don’t rely as much on analytics as other professionals do. I think if you’re involved in engagement and really paying attention to what’s happening, you feel what’s going on. And you can respond. Now, do I totally ignore analytics? No. But I’m someone who looks at them less and gets directly involved more. KH: Does that approach provide you with different advantages and disadvantages when working with clients? For example, does being so directly involved with campaigns provide any time-management difficulties? KJ: When you’re hands-on, your time management is absolutely different. But I think a smart manager is going to put things where they need to be. I might hire out my graphics and be more involved in engagement for one campaign. It’s aligning your talents appropriately to best meet the goals of a project. Is this an obstacle for time management? I suppose there are people who spend a lot more time than I do on analytics and reporting. 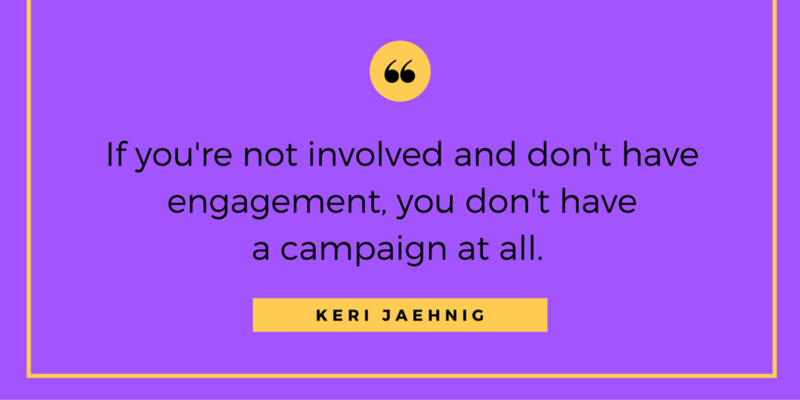 However, if you’re not involved and don’t have engagement, you don’t have a campaign at all. KH: Clients want to know how their social campaigns are doing. What sort of challenges do you face when it comes time to report, if you’re more hands-on than focused on reports? KJ: We absolutely provide reports. But some projects call for more reporting than others, of course. We also take specific areas of trends we notice and will expand upon them … So, it’s not that we don’t do it. It’s just that we’re very engagement-centric, where we’re focused on personal results — we want someone to see that their campaigns are a getting a response. KH: You have a background in international affairs and have managed the marketing components of large political campaigns. In the world of social media marketing, how does politics differ from other industries — such as real estate and information technology? KJ: I don’t work as much with politics now as I used to, so let’s keep that in mind. But what I can say is that every social media plan follows a skeleton. However, in politics I don’t think they quite understand that it’s provide value first and ask for donations second. They tend to have it reversed. I think, often, the more successful candidate will value communication and be more communicative. They’ll offer something instead of just broadcast a tweet. KH: Does that “skeleton” change at all when you’re running campaigns for big or small clients? KJ: No, I don’t think the skeleton changes. It’s consistent. But the one thing I will say is that once you get a campaign going, you’re constantly tweaking. It’s always a work-in-progress. It’s always trending toward what the audience wants to respond to. You’re always going to be in build and work mode. KH: Can you give me an example of having to tweak a social media campaign and it was bigger, more challenging or more important than you expected? KJ: I think earlier in my career, I had that experience. I was working for an international brand and they were a year out of startup mode, but were still growing. And we were focused on pushing for engagement … I started the campaign by largely using creative images to build engagement. Soon after, Pinterest had started up. Quickly jumping on the platform helped our engagement shoot through the roof. KH: Let’s shift the focus to you, personally. You’ve built an impressive online presence and established yourself as a social media thought-leader. What advice would you give to someone looking to become an influencer in their given field? KJ: I don’t sit here and think of myself as an influencer. I do what I do, and I try to put forth value. I hope that people will think of me as someone who leads by example and who’s always looking for improvement. I don’t expect anyone to do something that I wouldn’t do myself. And so, I’d just follow that line and say if people want to establish themselves, they need to learn the platform. They need to be constantly learning. Every day, I take time to learn something new. Every day, every week, every month, every quarter and every year I have learning goals to help me stay on top of my game. But you also have to offer value. You have to want to connect with people who have like-minded views. You have to find what your hotspot or niche is. And you have to work on achieving those new followers by finding what they want to learn and then providing that value. You also have to be there. That doesn’t mean you have to show up for 24 hours of the day, but be active at appropriate times. I was at a Twitter chat for an organization that included me in an infographic. I thought “Well, you were so kind to me. I should really show up.” I participated in the chat and talked about content marketing. I ended up making new contacts and hopefully provided answers that were useful for people there. You just have to remember that it’s give and take. Today I’m on the phone with you, but I’m going to share this post and offer value back to you. It’s just being a good social citizen. I don’t know if there’s one ingredient — it’s a 360-degree view of being a well-groomed and value-driven professional. KH: You touched on the idea that you should always look to learn new things. In constantly-changing fields such as social media, how important is it to regularly learn and improve your skillset? KJ: I think it’s the difference between being good and being excellent. You can be good at what you do. But if you want to be excellent, you’re always going to be working for it. 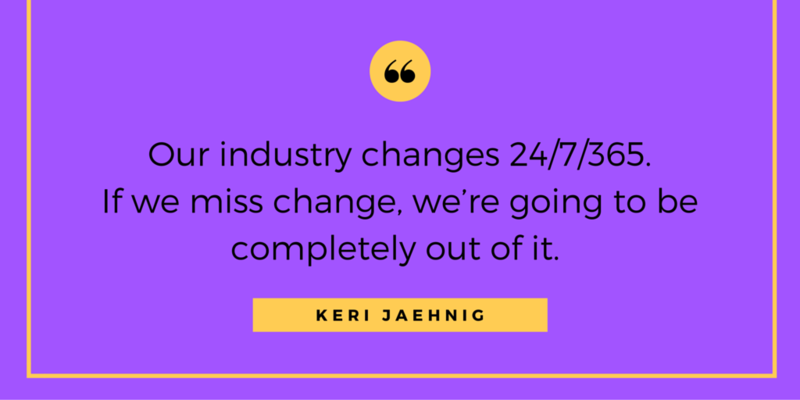 Our industry changes 24/7/365. If we miss change, we’re going to be completely out of it. KH: Let’s shift the focus to content. What’s the relationship between regularly creating high-quality content and growing your digital presence? KJ: It’s absolutely important to be consistent and to be creating high-quality content. It’s the difference between being there and not being there, really. Here’s something that I’ve noticed: We can post on Facebook and we can send our tweets out, but when my blog stops, so does everything else that’s related. The blog, continuously moving, is the key to everything else. It’s the hub. KH: Where do you see the future of content and content marketing in five years’ time? KJ: I think we can use Facebook as an indicator of where our minds, and content, want to go. What I mean is we’re becoming very video-oriented. I also think podcasts will be more of what we do and what we pay attention to. Virtual reality will also be big. Mark Zuckerberg feels that it’s going to be the most social of platforms — I certainly think that’s possible. But I also think there are are going to be new things that we can’t even think about right now. I’m sure there are also innovations around now that we haven’t thought about applying to marketing yet. KH: What challenges do you see for content marketers as we move toward a more multimedia — possibly virtual reality-based — model? KJ: We need to find people who are able to create that content. These are people who can consistently produce it while keeping up with the times. That’s going to be the biggest challenge. But I think there are always going to be people who can rise to the challenge. KH: Any opinions or bits of advice you’d like to leave the readers with? KJ: Always learn. Always offer value. 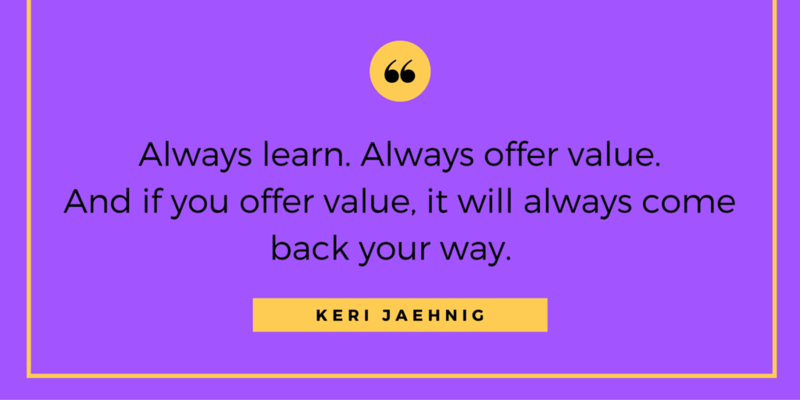 And if you offer value, it will always come back your way. Marcus did a great job with this interview! I’m both honored and excited to be featured here, and I hope my insights are helpful to others that are hoping to develop or improve their social media marketing and/or content marketing strategies. Everyone at Keyhole is top-notch — Thank you for this opportunity!! Thanks for your kind words — I’m looking forward to any possible collaborations in the future. I’ve interacted with Keri many times online, and I have to say she’ alway been supportive and engaging. Maybe her humanistic approach rather than looking at people as traffic is a testament to her success. Great to see her getting focus! I appreciate your comment, Robert. And I have to agree. Her approach is definitely different and a major reason for her success. Great to see you here – A pleasure interacting with you online. Perhaps the future holds an opportunity to collaborate at some point.